This study set out to explore conceptions of the elements or ingredients that lead to long-lasting happiness. A content analysis (Smith in Handbook of research methods in social and personality psychology. Cambridge University Press, Cambridge, 2000; Weber 1990) coded 201 respondents’ (18–84 years old) written happiness recipes for the mention of a priori (pre-defined from a literature review) and empirical (from a pilot study) content analysis categories. These were organized into six dimensions (i.e. Personality, Circumstances, Social Relationships, Behavioral Activities, Cognitive Activities and Volitional Activities) based on a model of the causes of long-term happiness (Lyubomirsky et al. in Rev Gen Psychol 9(2):111–131, 2005b). Participants were happy and mentally healthy. 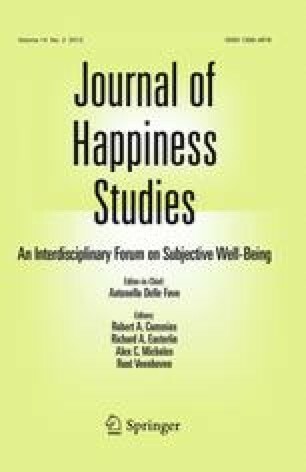 An overwhelming majority of responses referred to Social Relationships such as with Family, Friends and Partners, supporting the assertion that relationships are necessary for happiness (Diener and Oishi in Psychol Inquiry 16(4):162–167, 2005; Diener and Seligman in Psychol Sci Public Interest 5(1):1–32, 2002). Participants frequently mentioned Circumstances such as Health despite the fact these have been found to have a minimal influence over long-term happiness (Argyle in The foundations of hedonic psychology. Russel Sage Foundation, New York, 1999). Respondents mentioned a variety of New Behavioral Activities (e.g. time in Nature) that could offer a list of active leisure pursuits for use in happiness interventions. Finally, participants spoke of the importance of Social Values and having a Philosophy of Life (New Cognitive Activities). A recipe for long-term happiness is proposed based on past and current findings. No man is happy that does not think himself so (Marcus Aurelias, cited Diener 1984).